A stretched graphene kirigami spring (bottom) and a paper model (top). The traditional paper art of kirigami translates down to the microscale, providing a simple but powerful technique for building moving parts from graphene. Scale bar is 10 um. Credit: McEuen Group, Cornell University. Graphene can be folded and cut into complex structures just like paper, according to researchers at Cornell University [Blees et al., Nature 524 (2015) 204]. The ancient Japanese arts of origami (paper folding) and kirigami (paper cutting) have inspired scientists and engineers to manipulate sheets of two-dimensional materials like graphene into three-dimensional structures. But it turns out that graphene is even more like paper than previously thought. Paul L. McEuen and his colleagues have found that graphene has a high Föppl-von-Kármán number, which is determined by the ratio of in-plane stiffness and out-of-plane bending. A high value Kármán number indicates a material that bends and crumples more easily than it stretches and shears — just like paper. The researchers measured the bending stiffness of graphene monolayers and found a value thousands of times higher than predicted by its atomic properties. The reason appears to be that thermal fluctuations and static ripples, which are known to stiffen other membrane materials, have the same effect on graphene. The stiffening effect in graphene is enough to render its Kármán number on the order of 105—107 for a 10 um × 10 um sheet, comparable to a standard sheet of A4 paper. The similarity in Kármán numbers indicate that it should be possible to apply the principles of kirigami to graphene to create novel three-dimensional devices incorporating springs and hinges. The graphene the researchers use is grown on Cu by chemical vapor deposition and then transferred to silica wafers covered with an Al ‘release’ layer. Single-atom thick sheets of graphene 10—100 um in size are freed from the substrate by etching away the Al layer with a mild acid. Au ‘handles’ are deposited onto the graphene sheets using optical lithography, which can be employed to move or peel up the sheets with a sharp probe tip. 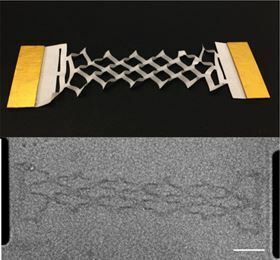 The researchers created highly stretchable graphene transistors by following a simple traditional kirigami pattern consisting of a series of offset, alternating cuts made using photolithography (as shown). When the spring is stretched, the graphene strips pop up and bend out in three dimensions. Remarkably, the conductance of graphene kirigami spring shows little change, even when stretched and released repeatedly. The team also created springs in the shape of pyramids and simple hinges that can be opened and shut over 10,000 times remotely using magnetic fields or a linked graphene structure.